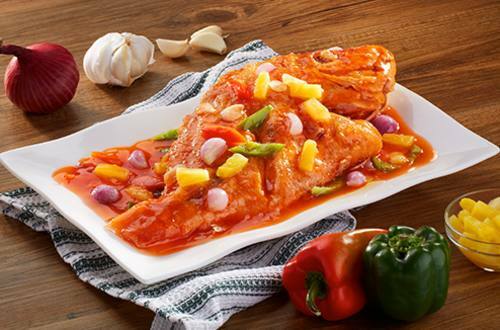 It's all about the sweet and tangy sauce made with Knorr Chicken Cubes that makes this a well loved Chinese dish. It blends perfectly well with the sweetness of banana ketchup and pineapples. Who's to say you can't make this restaurant quality dish at home? 1 There are 2 steps in making this delicious recipe. First, we need to prepare the fish then second, the sauce. Begin by giving the fish and nice seasoning of salt and pepper. 2 Next, prepare 2 bowls for the beaten egg and the other one is for the cornstarch. Dip the fish in the beaten egg then dredge in cornstarch. Prepare a shallow pot with oil and make it nice and hot over medium high heat. Fry the fish in hot oil until nicely browned. Remove and drain on top of a plate lined with paper towel. Set aside.